Validator 1 provides a fast and convenient method to create drive for benchtop setups. In addition, Validator can test the digital responses. Get started by editing spreadsheet templates, then download via a USB connection and run. Once downloaded, the pattern is automatically loaded in nonvolatile memory so the Validator can be untethered from the USB. Validator comes with a breakout board which can be used to translate digital levels up or down. The breakout board can also be used to mate digital channels to a custom connector. Validator comes with a suite of sample patterns. Out of the box, Validator can drive SPI patterns or create arbitrary analog waveforms with simple parameter data entry. A one time investment in creative worksheet design can create easy to use setups for future time-and-again requirements. Validator utilizes a 72 bit wide fast access memory that stores up to 4,096 lines of pattern. The memory can be clocked by the internal 24 Mhz oscillator or by an external clock. The external clock can be DC to 50Mhz. Memory is loaded via the USB connection. The pattern controller looks for commands at each line during pattern execution. The pattern can jump, pause, step, conditional jump if fail, and stop on fail. Digital IO can be programmed at each line to be either output or input with a weak pulldown. The system clock can be output any digital channel. Any input can be tested to be One or Zero at any line. IO outputs 3.3V levels. The Breakout Board has provision to translate IO to anywhere from 1.6V to 5V. The DACs are 10 bit each and can move 10V per microsecond. Their range is -10V to +10V. 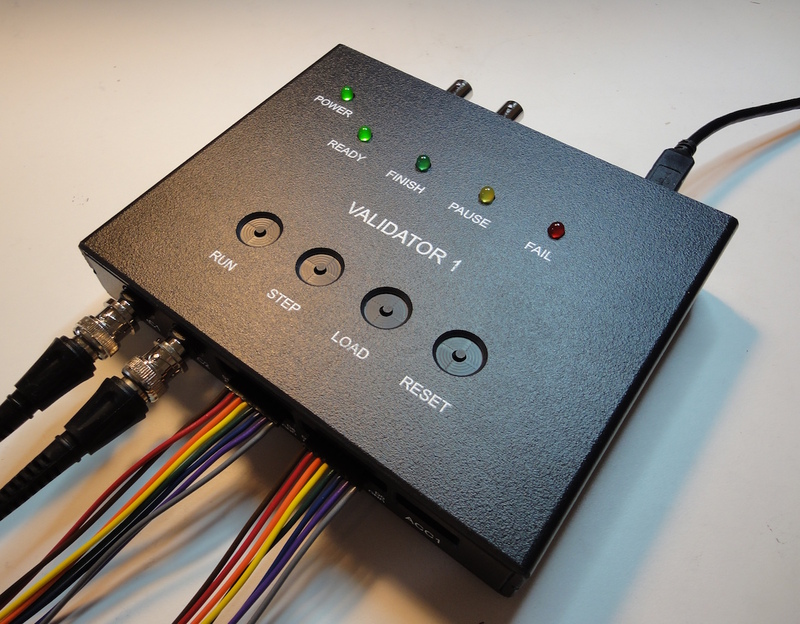 Validator 1 will operate standalone with a 5V supply or from a USB connection. If standalone, the last downloaded pattern is available in nonvolatile memory for load and execution. Validator 1 is 6.4 inches wide by 5.25 inches deep (excluding BNC) and 1.4 inches high. It weighs 12 oz. Validator ships with a memory stick loaded with the host application, “Validator1_Host”. Executing the application brings up the Control Panel which allows selection of the pattern to download to the Validator box. The Control Panel also exchanges control and status information with the Validator box. Validator downloads from a CSV file that must be prepared in a standard format. A CSV file may be created by a variety of means. Excel or Calc may be most expedient. Standard format Excel spreadsheets are provided on the memory stick. Start with one of the sample patterns and enter Setup data and Line data. See both the User Guide and Guide to Using Sample Patterns included on the memory stick. All files available on the memory stick are also available at the website. DACs can be programmed by equation using the elapsed time variable. Test channels in a loop and upon recognition of a code jump to a control pattern or test. With the power of the spreadsheet, create a tool to accept simple data entry and have Validator output a data transmission protocol. Make large parallel Digital IO or Analog setups with the simple provisions to achieve synchronous drive with Validators in a parallel configuration. Reload a pattern that is automatically stored in nonvolatile memory offsite without a computer. For pattern creation, all that is required is familiarity with spreadsheets. Select one of the supplied standard worksheets, make changes, and save the pattern in comma separated variable (CSV) format. Connect the USB cable to the Validator. 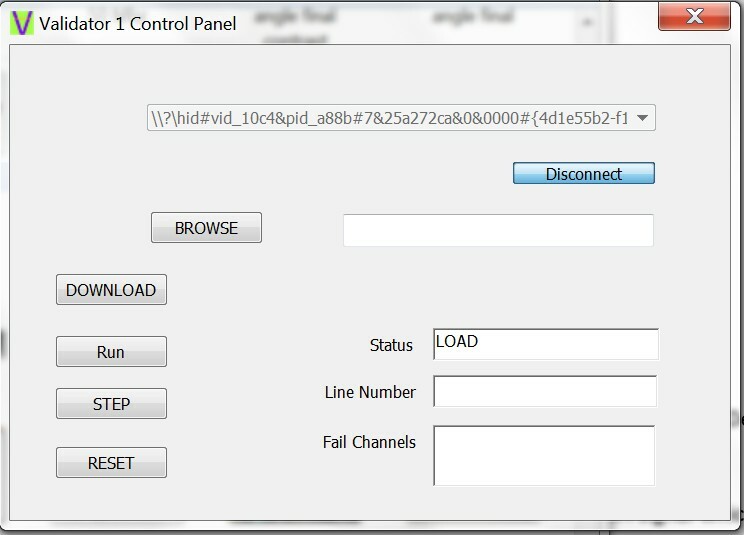 Double click “Validator1_Host” in a Windows environment and use the Control Panel to download the saved CSV file Pattern. Once downloaded, Validator retains the last program in nonvolatile memory. This allows unplugging the computer and taking the tester to the lab where any 5V supply can be the power source. After download, the Ready light is on and the Validator is ready to run the pattern. Control the pattern from either the host computer or use the buttons on the box. After powering down and back up again, reload the pattern using the Load button on the box or load a new pattern from the Control Panel. Refer to the User Guide and the Guide to Using Sample Patterns to discover all the options for driving your bench top setup. Use the Validator and determine if it’s the tool for you. If not, return it within 180 days and we’ll give you a full refund, including shipping. Every Validator comes with a 1-year warranty. If your Validator has any malfunction excepting an obvious application of an external overstress, let us know. We’ll send you replacements immediately, no shipping charges. Please keep shipping carton, packing material and contents intact, and contact Support at Sequim Tek immediately to initiate a claim. Please contact Support at Sequim Tek for a Return Material Authorization (RMA). Submit in writing the reason for the Return and the original Order Confirmation number. Sequim Tek will cover return shipping and send a return label for the box.